An enigmatic public speaker, writer, actor, a theoretician, analyst and philosopher – exposed to myriad interests, Mr. Bhandari pens on varied subjects ranging from law, philosophy, social structures, politics, economics, and literature. With a deep insight of Criminal, Matrimonial and Constitutional Law, Mr. Bhandari mentors law students and interns to help them develop an appreciation of the subjects. A practicing Advocate in Criminal, Matrimonial and Constitutional matters Mr. Bhandari takes up matters before the High Court of Punjab and Haryana, and districts and sessions courts of Chandigarh, Panchkula, and Mohali. Mr. Bhandari is registered as an advocate with the Bar Council of India and is a member of Punjab & Haryana Bar Association. Mr. Bhandari progresses with his lawsuits carrying a highly pragmatic mindset and articulates to perfection. 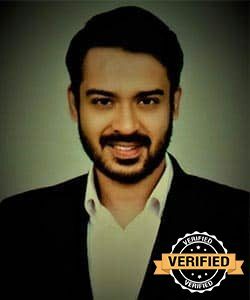 An ingenious orator, he is a reputed member of Toastmasters International and a winner of Resonance 2015 (District 41 – India), and Second Runner-up at International Speech Contest, Oration 2015 and Oration 2017. Adding to the numerous laurels, he is a consecutive public speaking champion at Toastmasters International, Chandigarh since 2014. Recipient of David Allen Award for Social Responsibility. National Level Roller Skating Champion. State-Level Chess Champion. Co-author of Buddha in Bihar (2012), under the concern of Ministry of Tourism, State of Bihar, Launched by Sh. Nitish Kumar – Chief Minister and prefaced by His Holiness Dalai Lama. Mr. Bhandari strives to achieve professional and personal goals with exemplary competence and excellence.